The poems in this weighty volume are too numerous and ponderous to summarize in a review. Some of them date from more than a dozen years ago. 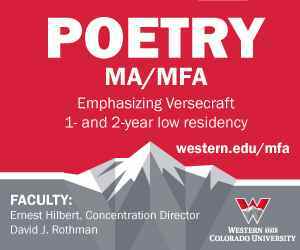 Verse forms vary (sonnets, blank verse, rhymed quatrains, heptameter couplets . . .), and so do topics. Some of the poems are deeply personal, such as the 250-line “Verse Letter to My Father,” the 150-line “Verse Letter to Jason,” his brother, and the 250-line “Verse Letter to My Mother.” We have epigraphs from Jacques Maritain, Ford Maddox Ford, Ezra Pound, Edmund Burke, and the New Testament, and poems “after” Baudelaire, Verlaine, Raissa Maritain, and Francis Ponge. With light and wet air off the river . . .
From these abyssal depths, I cry to You, My God, my goal. The cry isn’t always so anguished and explicit, but it permeates Wilson’s vision. We have experiences detailed in all their sensuous immediacy, plus a searching soul, a waiting spirit, confrontations with woe and mortality. “Solitaire” is a quiet poem for a solemn occasion, one of the most finished efforts in the collection. It starts with a mundane observation. Next to the untouched vodka in your freezer . . . There are flowers, too, but not fresh ones. To last in glass, seem angled but not broken. Someone has taken care to dump the old water and attend to the stems. Again, the rhythm halts and flows, thumping on the accented alliteration “Dead daf-,” stopping on a caesura, then running out in three smooth iambs. The enjambment of lines three and four draw together several elements into a complex image of decay and repair, which, it turns out, perfectly fits the central situation. Before it unfolds, though, Wilson adds another external detail, a contrasting one. So I have closed the sliding door. Here, with another “Your,” is the second indication of another person in the poem besides the speaker. Interestingly, she isn’t described directly. Instead, we have two distancing references, “Your freezer” and “Your neighbors’ kids.” In other words, they are not his. So what is he doing in this house, poking in the kitchen and shutting doors? We suspect that the rambunctious children aren’t just an annoyance to be squelched. Something more is going on inside. In the next lines we enter the resident’s room. You shut your eyes, I shuffle hush-mouthed cards, . . . The next line clarifies his presence, containing the first words that go beyond concrete description and voice a judgment. This is no vigil or imprisonment. The line trips along without pause, with six “-i-“ sounds. It starts with an impersonal declaration, “This is no,” that shifts the perspective to an abstract level. Obviously, she needs calm and quiet, so he shuffles quietly, no snapping of cards. Now we know that he doesn’t resent being there, nor is he waiting for her die. He’s just there, giving her his presence. Next, he explains why, at least partially. Watching you wake and sleep and wake in bed, . . .
She is sick or injured, recovering from an accident or surgery, or coping with a chronic disease. We don’t know and it doesn’t matter. She has a simple pattern of life right now, “wake and sleep and wake,” and he stays near, his own life suspended, “Watching,” playing a pointless card game over and over. You once, and hold you now, to prove I’ve learned. Wilson doesn’t identify the “hurt”; he only puts it in the past. She suffers now, from another pain, but he knows his responsibility. That’s what he’s “learned.” A former cruelty of some kind, however much it may have stemmed from passion or ache, calls for penance. It is not enough to regret it, to feel bad about it. You have to act upon it, to levy a cost upon yourself, such as halting your own life to serve another. The word “prove” marks that burden, which matches the Catholic sacrament of anointing the sick. It’s a strong poem, and it lingers once it’s over. I devote so much time to it because it demonstrates Wilson’s verbal artistry. It also exemplifies his prevailing themes of human suffering and moral duty, here planted firmly in a concrete scene. There are many other sobering episodes and affecting lines in this volume. It is to be worked through slowly, with lines parsed and reread at times of contemplation. I hope I have shown with the example of “Solitaire” that the labor is worth it.